The role of a CEO is a lot like being a crane operator. Each day, you’re pulling different levers based on what’s in front of you. You don’t want to be worried about whether you can make payroll in two weeks. Neither do you want to experience a sudden influx in business and be unprepared. That's why knowing your current and projected cash flow status can not only help prepare your staff, systems, and business processes for growth, but also to alert you to potential problems in your sales funnel, pricing or overhead costs. GrowthForce provides the budgeting services and cash flow tools and analysis that you need to keep your finger on the financial pulse of your business. We take the pain out of budgeting and make sure you understand your cash position each and every week. By leveraging our cash management and forecasting tools, you'll gain greater insight into the current and future financial health of your business. Our customized cash flow forecasting and reporting tools are designed to help businesses make timely decisions based on accurate and meaningful financial information. If your business relies heavily on paper and manual payment processes, you are impacting cash flow by extending your accounts receivable process and creating more in-house work and expense in order to get paid. 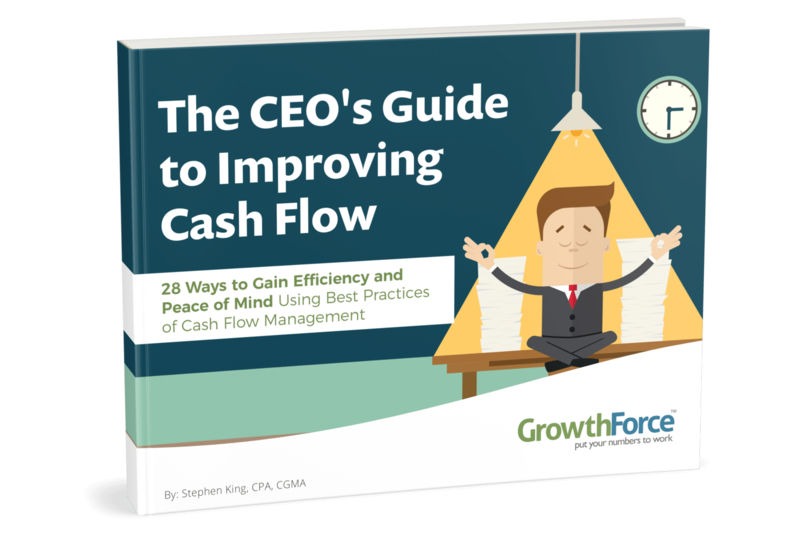 GrowthForce helps improve your cash flow by reducing the amount of time it takes to get paid. We will automate your cash flow processes and procedures to help your business operate more smoothly and efficiently. The number one decision that will make or break a business is how to price products or services. If the business doesn’t accurately track and account for the cost of doing business, and tie these expenses back into their pricing model, then they will inevitably have cash flow issues.